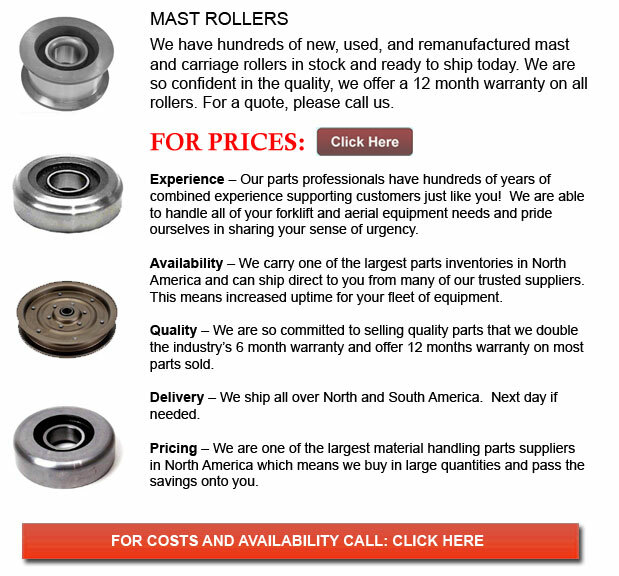 Mast Rollers - The mast of the lift truck is an integral part of the lift truck's frame. These forklift vehicles are huge industrial equipment that assist companies pick up a transfer supplies and merchandise. The vertical assembly responsible for lowering or raising a load is known as the mast. A forklift mast consists of interlocking rails that give sideways steadiness. These rails are guided by bushings or rollers. Utilizing metallic plates in order to help transfer merchandise, the masts are powered by hydraulic mechanisms. Hydraulics is the transmission of power which utilizes pressurized fluid, typically oil. Hydraulic cylinders that connect directly to the forklift motor are responsible for driving the mast, causing it to tilt, lower or lift a load. The pressurized oil drives the cylinder piston to be able to move in a linear motion, or in strokes. The mast is often operated via a handle in the cab or located in the part of the forklift that houses the lift truck control components and the operator. A swing mast is a forklift mast that could swing 90 degrees in one direction. The design enables the swing mast to function effectively in tight aisles.